It's amazing what a simple change can accomplish. In 1952, Batman readers were introduced to Garfield Lynns, the Firefly. He was a lighting expert who used his effects to commit robberies, and he stayed that way until 1993. Then, during the "Knightfall" crossover, Chuck Dixon and Graham Nolan recast Lynns as a pyrotechnic expert and arsonist. He'd appeared in less than half a dozen comics pre-Crisis, but after being reinvented, he's become a pretty major villain, not quite A-list (or even B-list), but important enough to get adapted for every cartoon and videogame that's come out since - he's even in the Dark Knight movie toyline! And all because someone felt like changing him. Unstable, erratic individual with advanced weaponry and demolition skills. 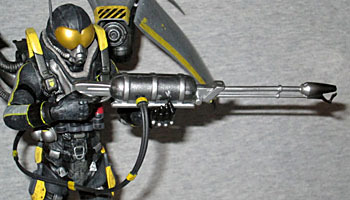 Lynns is equipped with a military-grade flamethrower and custom flight assembly acquired from an unascertained source. Has been alleged to steal chemical materials in bulk - aviation fuels, various chemical primers, and restricted reagents that suggest a specific chemical requirement for both the flight fuels and his incinerator device. His source files denote extensive psychological issues. Top level summary is that Lynns displays a total disregard for his well being at a level that would be classified as irrational. Extreme disregard for his own safety - this has caused or is symptomatic of the degree of burns he has suffered across his entire body. Training in pyrotechnics means that Lynns is skilled in the construction of incendiary devices, both handheld "pipebomb" size and large-scale demolition level charges. 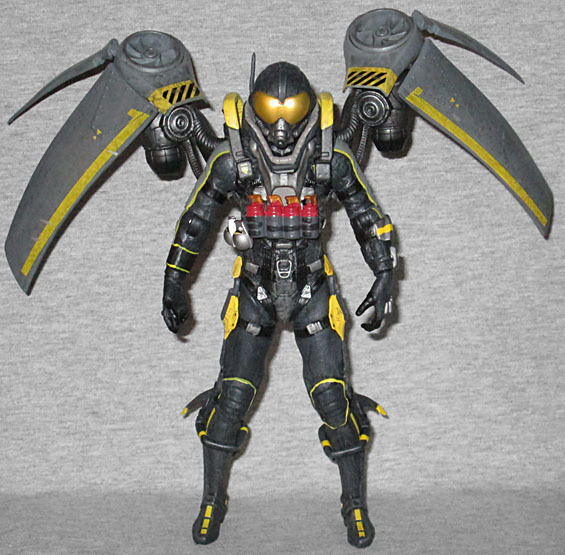 The Arkham Origins version of Firefly really takes the "fly" part literally. 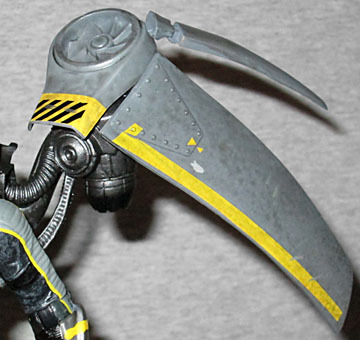 There's no missing the big wings sticking off his back, of course, but he appears to be wearing a military-style jumpsuit and his mask is just a normal flight helmet with a golden visor and a single antenna rising off the right side. Even if you ignore the wings, the flight harness creates some really cool details for the costume - remember, Firefly usually wears a plain gray suit, but this is much nicer. There's a big padded collar, metal bars over his shoulders, and a frame that runs from his back down the outside of his legs all the way to the tips of his toes, adding thigh armor, kneepads, and roll cages around the shins. Basically, it looks like he's wearing some kind of device that securely holds his entire body, so he doesn't fall out of the sky if a single clip happens to come undone (say, if it were to suffer a direct hit from a batarang or grappling hook, for instance). 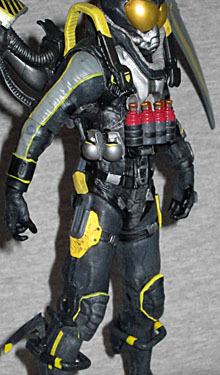 Suiting his destructive nature, he's got a bunch of grenades strapped to his chest. The wings themselves are fancy. A curved arm holds them away from his back slightly, and segmented hoses run between the body and the engine. A turbine is situated above a jet engine, and each side has one large wing and a smaller stabilizer or something. The pieces plug into the action figure's back, but can get knocked out of place easily. There are additional little winglets on the back of his knees - maybe they help him steer? The grenades on his chest aren't removable, so he's only armed with his flamethrower. It's a very long weapon, with a tank near the handle and a little pilot light below the barrel. A double rubber hose runs from the tank to the small of his back, suggesting the gun and the flight pack run on the same fuel. That seems like poor planning. Like, what happens when he has to decide between burning one more building, or flying back home safely? Arkham Firefly seems to owe a bit to his animated The Batman counterpart - rather than a colorless gray suit, this one has yellow accents. The body of the suit is dark grey, and there are lighter gray stripes down the outside of his arms. The yellow on this figure is just as sloppy as it was on Anarky. The figure has a balljointed head, swivel/hinge shoulders and elbows, swivel wrists, balljointed hips, and hinged knees. No waist, of course, but at least in his case we can blame that on the flight harness. Back when Firefly was still committing light-based crimes, Batman had a different foe - Firebug - who was an arsonist. But it wasn't some confusion between the two characters that led to Garfield Lynns becoming a pyromaniac; Chuck Dixon just thought his powers weren't interesting enough, so he rewrote them. As much as we as fans complain about retcons, sometimes they really do turn out for the best. Firefly went from a forgotten nobody to a standard part of the rogues gallery. Without that retcon, he certainly wouldn't have appeared in Arkham Origins, and we wouldn't have such a cool action figure of him.